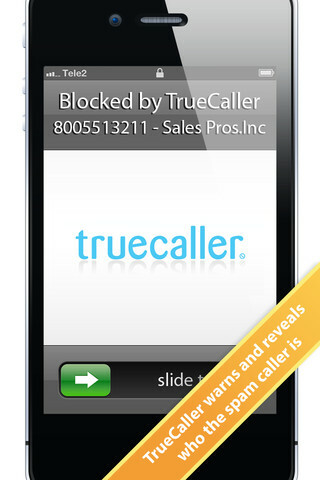 Another great application especially for iPhone lovers. 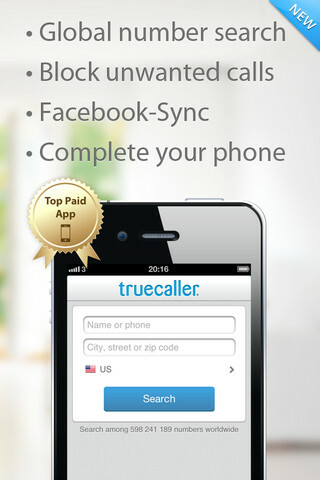 TrueCaller application can check worldwide database for the name with number with Caller ID ( to find out who is calling even the caller is not in your contact list) of any individual calling you and who is not in your contact list .TrueCaller application is available free of cost for BlackBerry Smartphone & Google’s Android too, so why wait download this application today and have the ability to worldwide search of names, address etc from their database totally free. It needs active data plan so remember to keep a check on your Data Plan..
TrueCaller is awarded as Top Application in US, Norway, Sweden, Denmark, Kuwait, Jordan and in many more countries with still counting on. That’s not all – MacWorld gave this application 100 % rating and that too for 3 years consecutively. Although there are many such applications doing the same work and function but the accuracy is the issue with them but you don’t have to worry as TrueCaller is the best application in its competition with the most accurate name & phone number lookup service, worldwide! TrueCaller allows you to look for close to billion numbers globally, This application can also update your facebook pictures & birthday and the most importantly defends you from spam calls. There is another function of reverse contact lookup that means you can search for a person name by searching from his/her number, isn’t that great ? This entry was posted on 11/08/2012, 6:26 PM and is filed under Applications. You can follow any responses to this entry through RSS 2.0. You can leave a response, or trackback from your own site.